Inside: Your ultimate guide to apple activities this fall. 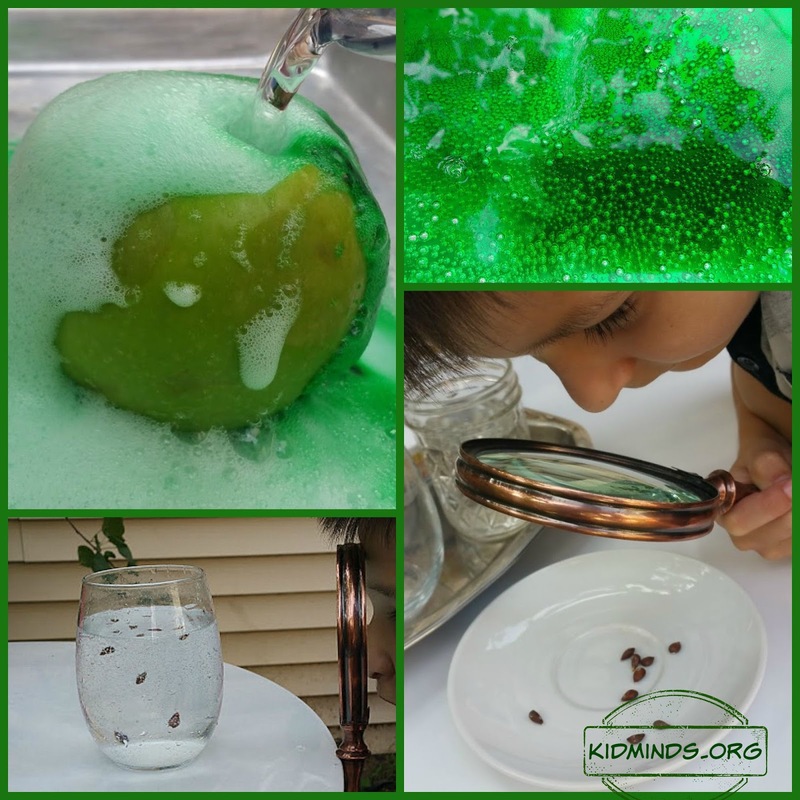 Apple science, apple crafts, apple sensory play, apple unity study, and more! What is the first thing that comes to your mind when I say “apple”? Quick! Don’t think about it! What did you say? If you think that’s all people come up with when they hear the word “apple,” keep reading. Our Facebook friends came up with “crisp,” “juicy,” and “gravity.” One person said, “pomme” (apple in French). Grandpa said, “Holler” (a place where we went apple picking this year). I said, “banana” because our car CD has a song called “Apples and Bananas.” And a woman down the street whose dog always barks at our dog said, “orange” (and if by any chance, you are reading this “we love you!”). And there were more responses: “computers, sweet, picking, green, New York.” We were amazed to get so many different answers. Since all people have different tastes and interests, here is our guide to various apple activities. Try them all or see what catches your eye. The goal of this roundup is to inspire you to do something fun with apples today! Oh, you knew I was going to say this one first, didn’t you? 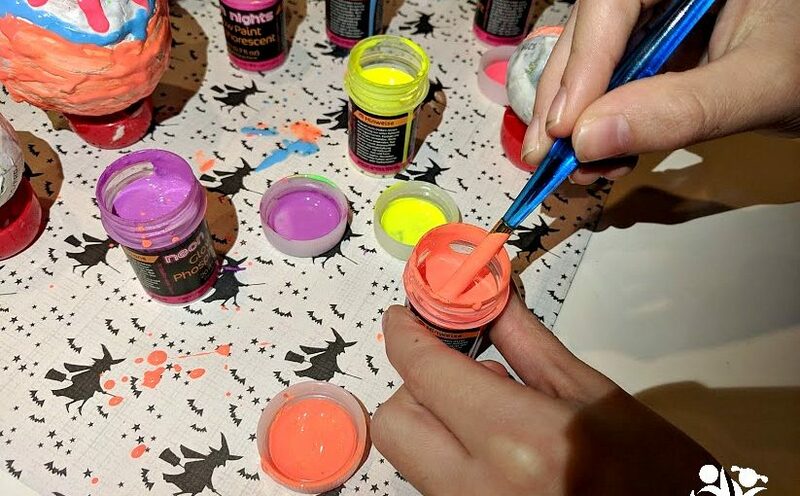 I can’t think of too many activities that are as much fun for the whole family and work for kids of multiple ages. In my childhood, apple picking meant sitting in my grandmother’s apple tree and eating a crazy number of unripe apples. Who could possibly wait for fall when apples were hanging so invitingly on a tree swaying in the breeze all summer, singing their siren song “eat me.” By the time apples were actually ripe it was September and I was back in a city sitting behind a school desk and dreaming of the next summer vacation. Now that I have kids and a small apple orchard in a backyard (3 apples trees to be exact), we still take time to enjoy a family trip to a nice big apple orchard. I love baking with my kids. Baking is an exciting science and a great introduction to math. Try it with your kids! 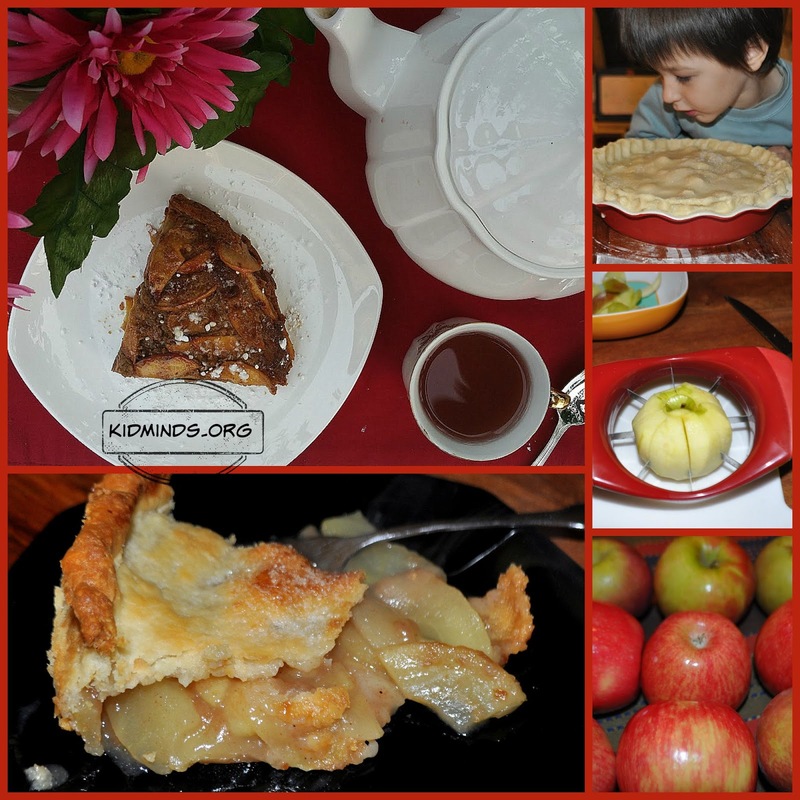 You might like this classical American pie or go for our healthy gluten-free Russian Apple pie. Can you almost feel a delicious aroma of baking pie just by looking at the photos? If you want to try something new, give this Homemade Apple Sorbet a chance. You will love it. Usually, the first thing I hear is a chorus of “Let’s blow it up!” Yep, you heard it right. Don’t worry, we do it with baking soda and vinegar! (Before I had kids, I would never have imagined I would be buying a 13lb bag of baking soda and 1.3 lb bottle of vinegar on nearly every trip to Costco). So, the first thing I recommend to do with apples is what we call Apple Volcano. Scoop out the apple, fill it with baking soda, add a few drops of food coloring, and then add vinegar. Voila! Loads of foamy fun all around. Another fun experiment we like is Dancing Apple Seeds. Dissolve a couple of teaspoons of baking soda in a glass of water (leave an inch of empty space at the top), add apple seeds, and then a teaspoon of vinegar. The seeds should start traveling up and down in the glass. Dancing Seeds! If nothing happens, just add more vinegar. If still nothing happens, add more baking soda. You can also try extracting apple juice with pectinase, brown apple experiment, or this simple one on a study of acids. 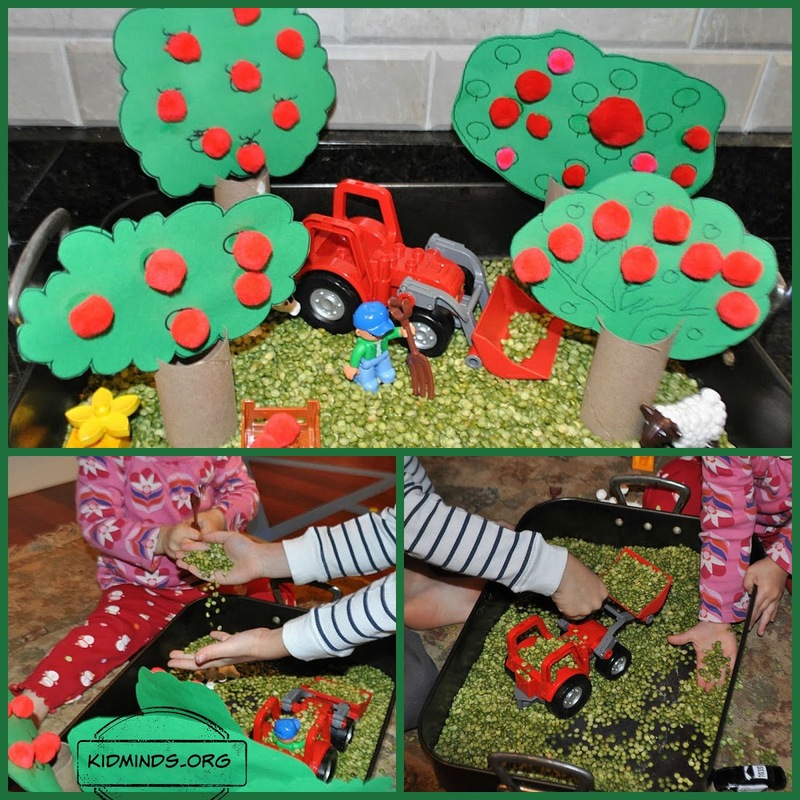 Green peas, oh green peas, how I love you… scattered all over my carpet… Not really, but everything has a price and I’m willing to deal with peas on my carpet for some sensory play fun. As you can see in the photos above we filled a roasting pan with peas and added “apple trees” and LEGO DUPLO tractor for hours (and I mean it, friends, for hours) of fun. For this project, I found some apple tree printouts (we like this one and this one because they are easy for kids to cut out) and printed them on green construction paper. Then we cut out the trees without the trunk. The toilet paper rolls became our trunks. We cut two slits on the sides and inserting the apple tree in them (surprisingly sturdy). Kids glued on red pom-poms (aka “red apples”). We planted our apple trees in a pea-filled tray, threw in a tractor, and some Lego Duplo people, and voila! If you think that bobbing for apples is an outside game, let me tell you it’s not! All you need is a large salad bowl, water, and apples! (Keep a mop nearby). Kids love it and end up having a healthy snack. Win-win! But if a splashy fun inside your kitchen is not for you, I hear you. 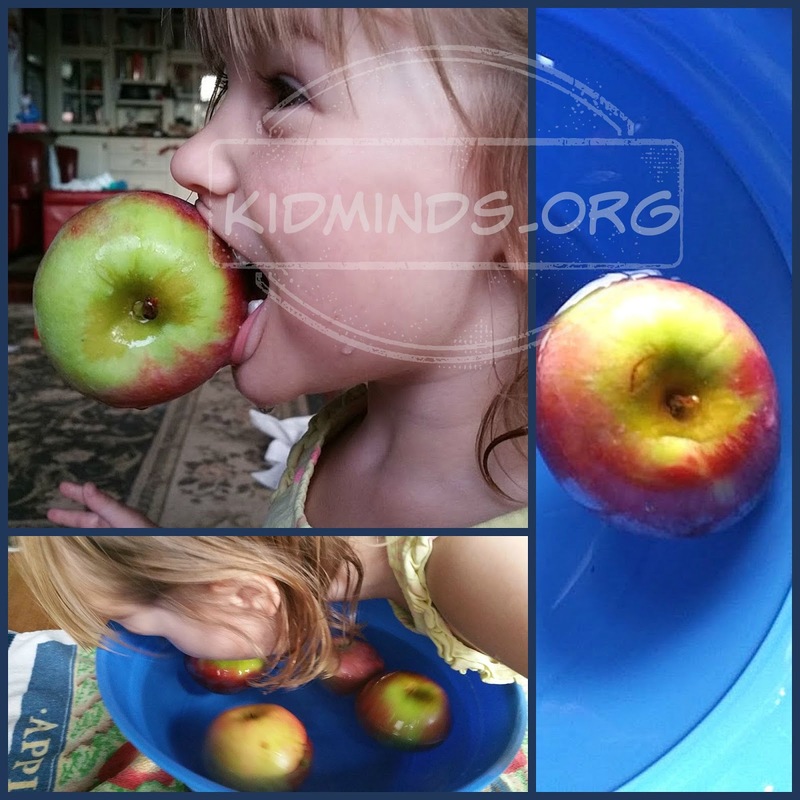 Here is a quiet table game you can play with apples. We call it Reverse Tic-Tac-Toe with Apples. Chop an apple up and use the pieces to play a classical tic-tac-toe game in reverse. You start with a filled grid and take turns eating a piece of apple. The goal is to avoid being a person who uncovers the whole row. Apple Stamp: If you like to eat apples, you probably end up with lots of apple cores. Here is a fine way to use them: turn them into stamps. It’s the easiest craft to set up. Eat an apple and then, instead of throwing the core away, cut it out like in the pic above, and use it for stamping. 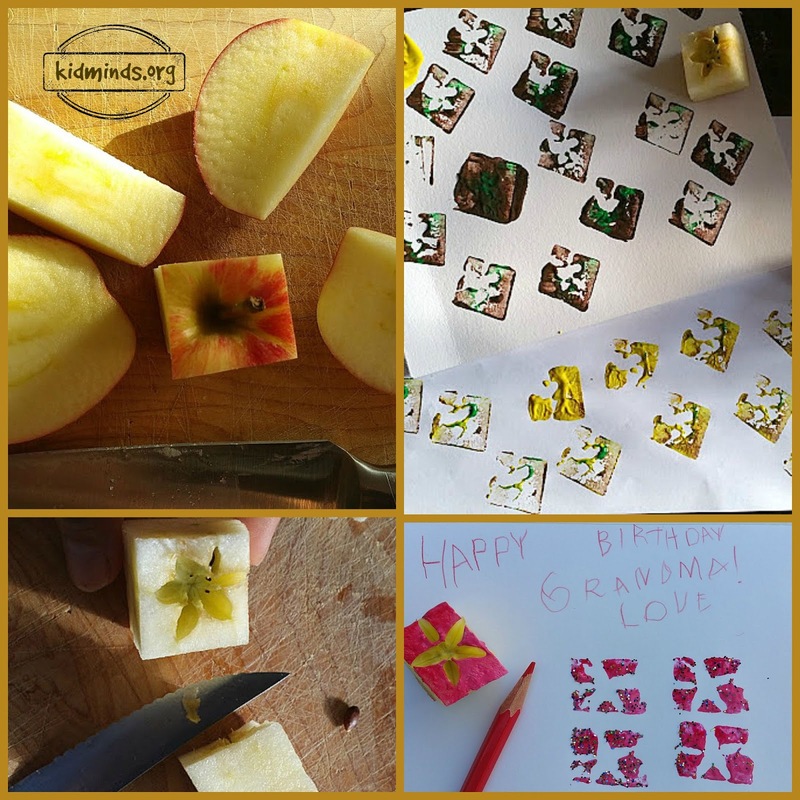 Fill a whole page with stamps or write a nice card for someone and decorate with an apple stamp. (We like to finish this project with lots of glitter). Threading an apple: Print out a fun apple like this one. Punch holes all around and thread the yarn through it. You can glue it to a piece of construction paper and send it as a card. Make those cute yarn apples to decorate your house or your backyard. It’s a fun and easy craft to make with your kids this fall. You will need water balloons, glue and yarn. Check out my Apple Activities Pinterest Board for more Apple Activities. There you will find roundups from some of the most popular bloggers on the web. 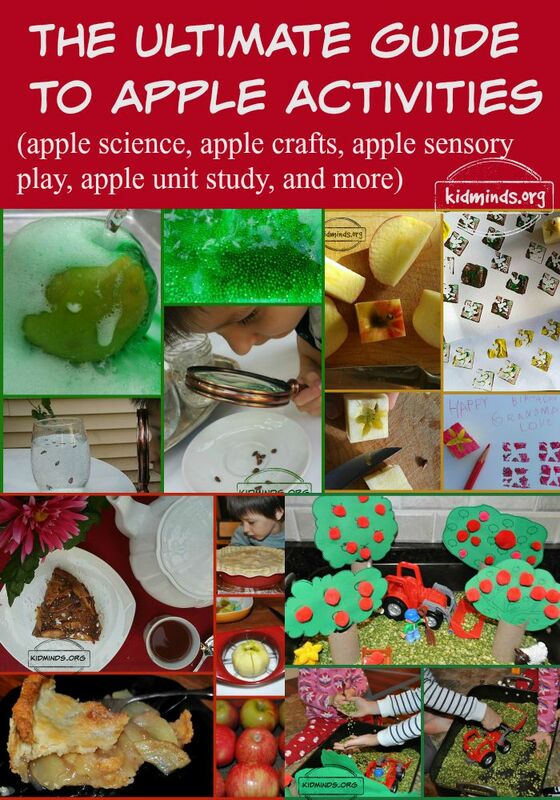 Follow Kid Minds’s board APPLE ACTIVITIES on Pinterest. What are your favorite apple activities? Hey Buddy!, I found this information for you: "The ultimate guide to Apple Activities". Here is the website link: http://kidminds.org/the-ultimate-guide-to-apple-activities/. Thank you.